This recipe was developed as a vegan appetizer version of that onion and spinach dip that probably everyone has had at some potluck or party some time in their life. You know the one–I think you mix sour cream, onion soup mix, mayonnaise, water chestnuts, and spinach. This has no dairy, no cholesterol, no unpronounceable chemicals or flavorings, and is almost as easy to make. Recently I made a version for a memorial service, and I didn’t have gobs of dehydrated onions or powders to throw in. So I used minced onions and minced garlic for one batch, and sauteed onions and garlic for the second batch, for less of a strong onion bite. Someone has already asked for the recipe, so it obviously tasted okay. I cannot post the exact recipe I used for the large batches, because I was making hundreds of pounds of food and had no time to measure or write anything down. Instead of 2 cups of tofu per batch, I used 2 blocks! I’ll give you some approximate amounts, though, to help you out. Blend all ingredients EXCEPT water chestnuts and spinach. Add water if necessary. Blend until it is smooth. Stir in water chestnuts and spinach. Serve with crudite or chips, or as a spread on bread, crostini, or crackers. I’ve also served it inside a round loaf of sweet bread. Cut off a thin slice from the top. Pull the center out in chunks, leaving a bowl-like shell. Put the dip into the bread bowl and serve the bread chunks for dipping. That makes a nice mix of sweet, sour, crunchy, salty, and creamy, and the dry bread soaks up the dip very nicely. Taste and see if you need to add more onion and/or garlic. Keep in mind that the flavors will meld nicely if you let it sit. I recommend you refrigerate this several hours, or overnight, before serving, but it’s not necessary. *Note about the spinach: I’ve used regular spinach and cholesterol spinach, and both worked well. You could probably substitute other cooked greens instead, such as kale or collard greens, to get a similar flavor. If the only croutons you’ve ever had have been from a box, or on an iceberg salad from a fast food place, you have no idea what you are missing. 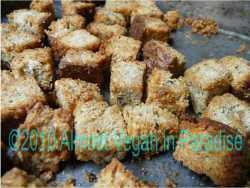 The taste, texture, and value of homemade croutons are fabulous. They are easy and delicious to make. So why aren’t you making your own? Maybe you just don’t know how. Here’s how to make croutons at home, with delicious results. Basically, croutons are just toasted bread. The difference is that they are toasted longer, so that the interior of the bread dries out, giving a satisfying crunch throughout, not just on the surface. However, if you like that crunch just on the outside, the good news is, you have full control when you make your own. You can leave them in the oven for less time, to get a softer, chewier finished product. Or keep them there longer, to get almost a tooth-shattering morsel. The choice is yours. Simply use some leftover bread. I don’t like bread heels, the slices you cut off at either end of a loaf. So I tend to use those, or just the odd slice or two that collects after a while. I also use the pieces that are broken up and can’t be used for a sandwich. If you make your bread with a bread machine, you know about those pieces. They are ones in the middle, where the paddle has been, and cut a big hole. Any bread is fine. You can use fresh bread or stale, whole grain or white, sweet or savory. I use a serrated knife to cut the bread into cubes. Place the bread cubes into a 9 by 13-inch baking pan. I prefer this to a cookie sheet, because the cubes stay inside when you mix them, but you can use a cookie sheet as well. Add the olive oil. Mix well. Sprinkle on the garlic and onion powders. Mix well. Spread out evenly in the pan. Bake at 350 degrees F for 10 to 15 minutes, until browned and hard. Stir halfway through. –Stick around while they are baking, because they can overcook very quickly. –Be sure to cool them completely before storing in an airtight container. –Try to make them on a day that’s not raining, because the moisture in the air from rain (and snow too?–I live in Hawaii–we don’t have snow–someone with experience will have to answer this for me!) will make them get soggy soon after you remove them from the oven. –You don’t even have to use bread slices. Any shape or size will work. Have some leftover rolls or buns? Use those. –In fact, for variation, try using sweet bread sometimes. It makes for a nice complement to a carrot soup, for example. –You can add salt if you like, but I leave it out because salad dressing has a lot of flavor, and I like my croutons to add to the flavor, not compete with it. –These are excellent on leafy green salads or soup. Try some with this vegan chocolate vegetable soup, for example. –They can be quite addictive, so don’t be surprised to find yourself munching on them right out of the oven! Now you know how to make croutons at home. It’s very straightforward and simple, and if you try it for yourself, you’ll see how delicious they are. You will likely never buy pre-made again. I know, I know. You’re becoming a food snob, like me! ha ha. These light vegan muffins never missed the eggs. Ah, summer fruits–berries, cherries, plums, peaches, nectarines, melons…hasn’t anyone written a song about this? If so, I’d be singing it now. I had a craving for blueberry muffins after purchasing some fresh blueberries. I found this recipe on a site about eggless cooking. The recipe comes from The Joy of Vegan Baking: The Compassionate Cooks’ Traditional Treats and Sinful Sweets by Colleen Patrick-Goudreau, which isn’t yet part of my already overflowing cookbook collection. I modified it only slightly, leaving out lemon extract and substituting soymilk for regular milk and whole wheat flour for unbleached. Because the only substitute for eggs was vinegar, I was worried the muffins would end up dense. But the end result was a light muffin with clean blueberry taste. The picture above is kind of odd. I ate most of them before remembering to take a picture. So I pulled the last three out of the fridge. That’s why they look a little sleepy! Mix together dry ingredients and zest. Add wet ingredients. Stir until just barely incorporated. Fold in blueberries. Fill non-stick muffin cups about 2/3 full. Bake at 400 degrees F for 30 minutes. No need to preheat your oven; I rarely do. Just leave it in an extra ten minutes. Test for doneness with a chopstick stuck in the center of one of the muffins in the middle of the pan. If it comes out clean, they are done. Very carefully remove from pan and let cool slightly. I like to eat my muffins warm, so they still have some crunch on the outside from the oven. *Use frozen blueberries. That way they will remain mostly suspended in the dough rather than all sinking to the bottom. *Do not overmix. Mix just until there are no dry ingredients rolling around. Overmixing will make tough muffins and/or create tunnels, large holes in them. Hard at work in my secret laboratory! I’ve just begun my latest mad science experiment. I’ve been making fermented dough–batter, actually–for dosa and uttapam, which are flatbreads typically eaten in South India for breakfast. Although the process takes time, it isn’t complicated. Rice and urad dahl are soaked in water for several hours, then drained and blended with water to create a slurry. The mixture is left to ferment overnight, but even here in Honolulu in summer, it took two days in my kitchen. You end up with a bubbling, stinky mixture that makes me feel like a crazy scientist in a hidden laboratory. Mwah ha ha ha! The batter is cooked like pancakes in a skillet or on a griddle. It can also be spread paper-thin so they cook into crisp rounds. I’ve tried them with and without fenugreek seeds, which add a fragrance akin to maple syrup, and I’m going to try them again with chana dahl (garbanzo beans) once I go buy some. Salt is added after the ferment so that it doesn’t slow the fermentation process down. I have fallen in love with the tangy flavor, reminiscent of a good sourdough bread. While I have yet to get the techniques for cooking down, the result is nevertheless delicious and well worth the advance planning. Next I need to get good variations on the accompanying dishes they are usually served with. One is coconut sambar or chutney, another is tomato chutney, and a third is sambar, a watery dahl and vegetable curry just perfect for dipping into. There is a recipe and video here. I wish I had paid more attention. Not that it would be helping me now. But I didn’t fully appreciate roti canai while I was in Malaysia, eating it every third day or so. Roti canai (pronounced chahn-eye) is a flatbread with a crispy outside and flaky, soft layers inside. It is a Malaysian variation of Indian parathas, another flatbread. Most of the time there was one Indian man at the bread table, making these to order. Sometimes we had it plain, for dipping in curries. Sometimes it had onions inside, cooked til crisp-tender and sweet. A dessert version contained bananas, palm sugar, and butter or margarine. I’m drooling just thinking about them. Of course I want to be able to make some at home. Internet searching produced several different recipes and a number of videos showing the shaping of the bread. The dough gets flung in circular motions, somewhat like the skirt of a flamenco dancer, until it is thin enough to see through, and large as a pizza. It is folded over onto itself like an envelope, which traps bubbles of air and fat, giving it flaky layers. My first attempt wasn’t too bad, but the dough never got really thin, and there were no flaky layers. I decided to try a different dough recipe. Last night the dough balls soaked in a bowl of oil. Today I attempted to shape them into thin rounds, and while the dough looked more like how it does in the videos, and I could get it much thinner, it was still not working. I used whole wheat flour, which may have been part of the problem, since the bran and germ seemed to contribute to all the holes I was getting. I’ll have to try again using unbleached flour. My technique isn’t too bad, considering I’ve only done this twice. It almost looks like the people in the videos, except that my dough doesn’t land in a graceful circle on the counter. It sort of crashes, the way some ducks and other birds land on water, stopping forcefully and suddenly, jerking forward and smashing their faces. I may have to go back to Malaysia to eat more!